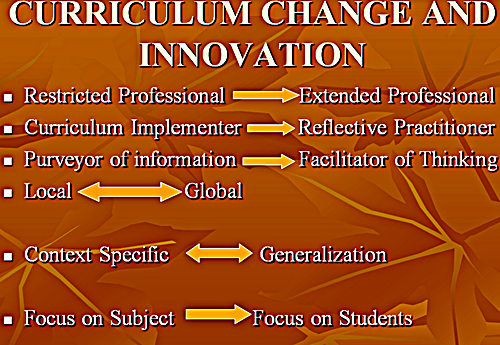 Curriculum change is a generic that include a whole family of concepts such as 'innovation, development and adaption' it includes change that can be either planned or unplanned (unintentional, spontaneous or accidental), Marsh & George Willis (1999:150). Change in educational depends to a very large extent upon the process of institutionalization which, help to transform the general potentialities for change into historical realities. Education, generally speaking, is a conserving institution, seeking to maintain and to mediate the culture heritage of society, S.N Eisenstaedt (1964 as referenced in Ivor Morish 1967: 23). This mean that there are must be some attempt the old culture to new condition in order that individual within society might keep up with technological change, and culture however should trough the processes of educational dynamic, and it should perform a directional role. Change is not only occurring by its self, but there many factors that influence change occur, such as innovation, development and adoption etc. M.B Milles (1955, as referenced in Ivor Morish 1967:28), states that there are a number of environmental factor which enable and dispose educational system to change. Some are quite specific, such as size, complexity, finances and congruence between the innovation and the values and practices of those who receive them; and others are of a more general nature. Ivor Morrish (1976:29), state, other areas of change occur in terms of financial allocation to research and development, buildings, materials, staffing and so forth. Much here will depend upon whether society is going through a period of expansion or retrenchment, inflation or deflation. Innovation process is the planned application of ends or means new to the adopting education system, and intended to improve the effectiveness and/or efficiency of the system, Henderson (1985:3). This definition, with its emphasis on interaction and application, indicates that the process of innovation includes not only an awareness of alternative but definite intention to implement one or more alternatives. In addition Hendrson’s definition also directs intention to improving the effectiveness of a system. Educators do not always agree with the contention that a change has to be an improvement to quality as an innovation. Whether an innovation is regarded as an improvement or not depends, of course, on the judgment of who ever makes the decision about adoption, with the judgment usually made in terms of aspiration and past experience. In consideration of the general parameters of educational innovation, Westley (1964:158) argues that there are three processes at work. First, innovations tends to occur through the accumulation of a variety of changes; some quite small, such as the introduction of a new text book; some more widespread, such as a general improvement in the professional education and training of teachers. Other changes are effected more at the level of measurement techniques, such as the improvement of testing and diagnostic methods. All such changes as these, however, are usually developed slowly, but the total effect is continual improvement in the education system as a whole. Secondly, there is a what Westley calls the “grass root” theory of the development of change; the system as a whole is perpetually being infused with new idea, and it is transforming those with it is prepared to assimilate into some newly conceived from more constant with its own norms and practice. Thirdly, changes occur in policy decision; a central governmental authority decides to adopt a new idea and issues the requisite regulations and instructions to bring it into effect. These three analyzed by Westley are probably at work in most innovations that are eventually introduced. Thus, innovation is always needed, especially in the field of education to overcome the problems that are not only limited to education but also the problems that influence the process of education process. Rosenblum & Louis (1981: 1) argued the need of innovation in education. Innovation often treated as change, but not all of change is able to be treated as innovation. Mars and George Willis (199:151) state, that the terms of innovation may mean either a new object, idea, or practice or the process by which a new object, idea, or practice comes to adopted by an individual group or organization. In my view, with curriculum innovation, you would be teaching the subject in a new way, perhaps connected with other activities. For example, if you are teaching about a certain book, like the independent day of Indonesia, you might have the students learn about the 1945s, about lifestyles of blacks and whites in that particular town, and what was going on during that time in Indonesia. If it hasn't been done before, it might be useful to include a simulation of some experience, bring in someone who lived in those times--an experience that will transform the knowledge that the students have. However a change in curriculum will effect the subjects being taught. An alternative book, like the independent day of Indonesia, would be required reading instead. The independent day of Indonesia might be moved to a reading list for juniors from the freshman year or to the curriculum of another class, such as history. 5. Complexity: the degree to which an innovation may be experimented with on a limited basis. Based on the statements above, it implies that the appearing of an innovation is caused by the problems of education that have to be solved, and the way to solve it is through innovation (often referred to as "renewal", although this term is not identical with innovation). The innovation should be resulted by original thinking, creative, and unconventional. The implementation of the innovation should be simple by involving comfort and convenience elements. All this is forwarded as an attempt to improve the situation of education. One important aspect in any context of education is by understanding the curriculum that is implemented by national education. Often the curriculum becomes a scapegoat due to the failure of the education because of changing of curriculum. In fact, it should be understood that the curriculum has to move dynamically, has to be changed in order to follow the changes in society. Cuban (1991: 216) suggests that to understand the curriculum changes necessary to understand three basic concepts of these changes, namely (a) the plan of change is always good, (b) must be separated between the change with stability, and (c) if the plan of change has been adopted, it is needed the improvement of the plan.